In Touch is a not-for-profit organisation providing a welcome Handyperson Service for residents living in the following Local Authority areas: Havant; Gosport; Fareham; Eastleigh; East Hants; Winchester; Basingstoke; Hart; and Rushmoor (see flyer and leaflet for further information). The service is subsidised by Supporting People from Hampshire County Council to provide a service for three days a week in these areas. Some Local Authorities provide additional funding to provide more days. Because In Touch is subsidised it can keep labour costs to disabled customers and those over 60 to a minimum. It can carry out free assessments and free home safety checks. It is also a distributor of HCC's 'Hitting The Cold Spot' packs which contain very useful energy advice and information about staying warm. There are some of these packs available in the Parish Office at Lindford Village Hall. All its handypersons are employed by In Touch and have undergone enhanced CRB checks. Calls are charged at the local call rate. Talks/presentations are offered for any groups who are interested in hearing more about the service. Neil Richardson is employed by the energy company SSE as a Community Liaison Officer. He works with residents in the community delivering energy efficiency, dealing with billing issues, debt advice, tariff information, payment plans, heating controls, vulnerability, Warm House Discount etc. He visits residents in their homes, gives Energy Efficiency talks in the community and works with local councils and groups in his area, which is PO and SO post codes but he does cover a triangle from Worthing to Poole and north to Guildford. At the moment he is tasked with giving as many talks as possible, offering Energy Efficiency Advice and introducing Smart Meters. His role is a trial, the more he can help people the longer his role will continue. This is a free service, he does not sell, he talks to all residents not just SSE customers. What SSE gets out of his role is to be seen working in the community in a positive and helpful manner; the feedback he receives is very rewarding. To contact Neil, phone 07825 014164 or email him. Food and Friendship is a free-of-charge service available to Meals on Wheels customers who would like a regular visit from a friendly volunteer around mealtimes. It is run by Age Concern Hampshire and has been funded by Hampshire County Council and the District Councils. It is available currently in East Hampshire, Basingstoke and Deane, Eastleigh, Fareham, Gosport, Havant, Hart, Rushmoor, Test Valley and Winchester. The volunteers help make mealtimes a little more enjoyable, chat about things that interest the client and let them know what is going on in their local community. They can also offer ideas on healthy snacks and meals, for which full training and support is provided by Age Concern Hampshire. If you would like any more information about Food and Friendship in your community, or know anyone who would be interested in volunteering, please contact the Coordinator, Paul Simmonds, on 01962 892455 or by email at food&friendship@ageconcernhampshire.org.uk. Food and Friendship has produced its latest newsletter. Lindford Ladies is a friendship group of women from Lindford and the surrounding area, from all walks of life and ages. It meets monthly on the second Monday of each month mostly at the Methodist Church Hall. Women of all ages are very welcome. Activities are wide-ranging from talks about trips to New Zealand to making Christmas crackers, from quizzes to knitting. For further details contact Michaela Canning. Pollyanna Preschool has been offering high quality childcare since 1989 and we are situated at Lindford Church Hall, Chase Road, Lindford. We offer and provide an exciting, happy, safe, secure, challenging, inquisitive and stimulating environment both inside and outside. We encourage all children to develop friendships as well as the confidence and new skills required for their early years in school. We are an approved provider to offer funding for 2 year old and 3 year old children. For a prospectus, to arrange a visit or further information please contact Mrs Lesley Cooper on either 01420 476114 or by email. You can find the latest programme for the Phoenix Theatre by following this link. Steady and Strong exercise classes offer a better balance for life and it is never to late to start! The Alton and District Group of the Ramblers Association is a very friendly group of walkers. There is a programme of weekday and Sunday walks on the website. During the week, on Tuesday, Wednesday or Thursday, there is always a short walk of about 5 miles and usually every other week a longer one of about 10 miles. On one evening each week in the summer, there is a walk of about 5 miles. The Sunday walks are between 10 and 12 miles. This is a wonderful way to keep fit and to make new friends. There is a local Walking for Health group in Bordon Whitehill that meets every Monday at 10.30am for a 2 to 3 mile walk. There are also groups at Headley, Kingsley, Liphook and Alice Holt Forest: see the Walking for Health website for more information. Leader training courses are offered and East Hants District Council occasionally offers training days. Alton and its surrounding countryside provide lots of wonderful opportunities for walking. Walk Alton is a group of local volunteers working to develop walking activities in the Alton area. The group wants to encourage walking both for recreation and to support local initiatives to improve people�s health and well-being. The development of walking facilities will benefit both local people and visitors. Walk Alton is developing a website to highlight the many benefits of walking. It will be signposting the many beautiful short and medium distance walks the area offers, along with the longer distance trails like the Hangers Way, the Writers� Way and St Swithun�s Way, as well as introducing the various walking clubs and initiatives that exist, including the highly popular month long Alton walking festival. Walk Alton is seeking to regain Alton�s accreditation as a Walkers are Welcome destination https://walkersarewelcome.org.uk/walkers-are-welcome-and-who-we-are/. Affiliation to this nationwide network of towns and villages will give wider publicity to Alton as a walking destination and help to demonstrate that Alton is a walk-friendly town. It will also help promote tourism and bring new footfall to Alton and the surrounding area. Helen Dudley is secretary and treasurer of Walk Alton. Her contact details are: helendudley78@sky.com, tel 07887-744959]. The Deadwater Valley Trust (DVT) has a monthly dog walking group and a monthly working party in Hogmoor Inclosure on the third Saturday of each month. Members of the Bordon Business Exchange (http://www.bordonbusinessexchange.com/) meet on the first Tuesday of the month from 8.00-10.00am at The Royal Exchange, Lindford. The format is informal networking over breakfast, then a short update on the Bordon and Whitehill regeneration project at 9 am. This is followed by a 20 minute presentation celebrating the successes and failures of a local business, followed by a led discussion. Other more specialised events could potentially �spin off� from this general networking forum. For example, a startup �SOUP� meeting is planned for the middle of the year to attract less established businesses in the area. Partners are: Red Mist (Julian Clarke); The B & W Regeneration Company (James Child); Enterprise Nation (Emma Selby). Hampshire County Council has commissioned Aster Living to provide a subsidised handyperson service across Hampshire for anyone over the age of 55, or anyone who is disabled (including families with disabled children). The aim is to provide a value for money and trusted handyman service to get those jobs done around the house that the householder can�t do. See the sample advertisement and the leaflet for further information. Community Solutions is an Information and Support Service for people and for organisations in and around Whitehill and Bordon. There's lots going on and many community organisations offering useful services in the town but it is sometimes difficult to find out about them. That's what Community Solutions is all about. Click here to go to their website where you will find more information and a link to the latest e-newsletter. Mobile library timetables are available under mobile libraries at www.hants.gov.uk/library. Stops can be checked by entering a postcode or village name into the 'Search for a Timetable' function, enabling you to bring up the nearest mobile stop to that location. You can also access a printable timetable with dates until March 2013 by clicking on the route button next to the stop. Alternatively there is an alphabetical list under the 'Timetables from 22 October' tab. Hampshire Library Service runs a free Home Library Service for Hampshire residents who are unable, or for whom it is very difficulty, to get to their local library or mobile library stop due to frailty, mobility problems or caring responsibilities. We currently have capacity to visit more people in their own homes thanks to our team of willing volunteers at Bordon Library, who are all CRB checked, fully trained and supported by library staff. To apply contact staff at your local library, go to the library website www.hants.gov.uk/library, telephone 0845 6035631, or contact Nicolette Morgan. You can find the timetable for the no 18 bus on Surrey County Council�s website or Stagecoach�s. Mediationfirst is a registered charity covering the Boroughs of Waverley and East Hants. The purpose of the service is to seek the resolution of actual or potential conflict between individuals, groups or organisations through a neutral third party intervention, so that different perspectives on a problem and opposing positions may be heard and where possible reconciled. See the leaflet and the guidance for referrers for further information. East Hants District Council has appointed Kim Hardwick as Transport Manager for Whitehill and Bordon Eco-town. She has produced a leaflet about lift-sharing and another about the local cycle shops. She can be contacted on 07833 970210 or by email. She has set up a blog and is aiming to post on it once a week. In addition to the Bordon Link and the Grayshott to Bordon Call & Go, there is now a new commuter taxi-share service. This pre-book service will link Lindford to Haslemere station providing a key commuter option for those without access to a car. Information on the route, pick up times and the cost can be found at www.hants.gov.uk/taxishares or by calling 01962 846786 for more information. The Parish Council has an open space policy which is displayed and applies on all the Council-owned open spaces. The Parish Council has a supply of litter-picking sticks. Many have been given to residents so that they can clear litter in the area where they live. If you would like to help clean up the village and would use a litter-picking stick, please contact the Parish Office at the Village Hall on 01420 474881. Transport provided by community organisations is vital for many people in Hampshire to help them access services. Hampshire County Council, in partnership with the Hampshire Volunteer Centre Network, the CVS Network and the Good Neighbours Support Service has organised a campaign to recruit volunteer minibus and car drivers to drive minibuses owned by not-for-profit organisations subject to the appropriate training, or to carry passengers in their own cars for which they will receive a mileage allowance. Volunteers can give as little or as much time as they would like. The campaign aims to raise awareness of driving as a volunteering opportunity and how people can get involved. Anyone interested in finding out about becoming a volunteer driver can read more details online at www.hants.gov.uk/volunteerdrivers or contact the Hampshire Volunteer Centre Network on 0844 499 4088. The Wheels to Work moped loan scheme is designed for people aged between 16 and 25 who do not have access to public or private transport to get them to a job, vocational training or to attend interviews. A moped can be loaned for 3 to 12 months depending on your circumstances. For more information see the webpage. Hampshire County Council has now begun placing statutory public notice adverts in a free publication called the Hampshire Independent. This project has been the subject of extensive dialogue with district and borough councils at the Hampshire and Isle of Wight Strategic Procurement Partnership (HIOWSPP). By publishing the notices in a free newspaper, the County Council aims to make public notices widely available in a cost-effective way (on a like-for-like basis the County Council is expecting a reduction in cost of around 50%). The Hampshire Independent will be available free of charge at a large number of outlets across Hampshire, including retail organisations such as Tesco Express and ASDA and at County Council establishments such as libraries. There will be five copies in Lindford Parish Council office. Hampshire residents have been informed of these changes by means of a short article in the latest edition of Hampshire Now and further information appears on the County Council website. Public notices are now available online at www.hants.gov.uk/publicnotices, making them more accessible to a wide cross-section of residents. This improves the transparency of public messages by placing them in the most convenient channel for residents. Other councils wishing to publish their notices on the County Council�s portal are also now able to subscribe to the service for a small fee. Residents who do not have access to the internet may wish to visit their Parish Council office to see a public notice. The portal is very simple to use but if you need more details about it, please contact Debbie Parin, Procurement Manager for Partnerships on 02392 467253. A number of authorities are already using the online Hampshire public notices portal and there has been strong interest in the new advertising/publication contract from a number of councils. The County Council's public notices can be viewed online together with those of several other Hampshire authorities, for example, Fareham Borough Council. Members of the public who do not have access to the internet at home can view these web pages at their local library. Special arrangements have also been made for people who may find it difficult to obtain a copy of the Hampshire Independent. In these circumstances, the company will post a copy to individual members of the public free of charge. Contact Assistant Director, Neil Jones (01962 846180), or Project Manager, Debbie Parin, with any queries or questions. If you would like to see a map showing the Safe Places, click here. 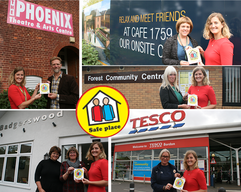 If you would like to offer a Safe Place, please contact Rebecca Treharne, EHDC�s Healthy New Towns Project Officer on Rebecca.treharne@easthants.gov.uk. Hampshire Association of Local Councils (HALC) has issued a newsletter on community safety issues and leaflets about bike safety and internet safety. Rightdriver has a contract with the Driver and Vehicle Standards Agency (DVSA) enabling it to provide free Highway Code education for car, motorbike and lorry� for men and women on Rightdriver.co.uk. This site is preferred and used by a large number of driving instructors, youth organisations (such as scouts and army cadets), schools, community organisations and more to help people get their driver�s licence because of its free official Highway Code questions. Hampshire Constabulary has put out a Crime Prevention Sheet about refurbishing or building properties. Community SpeedWatch allows members of the community to become police support volunteers and take action, helping us to educate drivers on the roads of concern in your area. SpeedWatch is a community scheme that can only take place in 20mph, 30mph and some 40 mph limits or zones. The scheme is managed by the police local Safer Neighbourhood teams but run by volunteers. Volunteers use equipment that can monitor the speed of passing traffic and record the details, later adding them to a database. Vehicle checks are undertaken by the police and letters then sent to the registered keepers advising them of the speed and reminding them of why it is a community concern. SpeedWatch is not enforcement, it is education. It is important to know that SpeedWatch now forms part of our response to speeding issues. It is the first tier in our response to dealing with this problem. If a problem persists, we will escalate to tier two, meaning that enforcement can be undertaken by the police Safer Neighbourhood teams. What usually happens, is that the police get various volunteers from the local community. They spend an hour of their time with the speed gun taking readings from passing traffic on designated roads. This data is then fed back through the police system, and letters are sent to the offending persons. It is a good scheme, and has been very successful in the places it has been set up (for example, since January, Selborne has sent out 11,006 letters!). See the guidelines and the poster for more information about volunteering. � Home fire safety visits, by appointment only, for vulnerable members of the community, such as the elderly or disabled, including fitting smoke detectors free. � Locating migrant farm workers to ensure their domestic fire safety is maximised, through the Home Fire Safety Visits. If you wish to discuss anything with the Risk Reduction Officer contact Fire Fighter Simon Mills, Rural Risk Reduction Officer, East Hampshire; mobile: 07584 704537; work: 01256 300377; speed dial: 705 5012; email: simon.mills@hantsfire.gov.uk; Web: www.hantsfire.gov.uk; Alton Fire Station 19 Butts Rd, Alton. GU34 1LL. � Deadlock your doors with the key � don�t just lift up the handle. � Keep valuable items out of view � if you have electrical equipment worth hundreds of pounds, don�t keep it by the window where passers-by can see it. � Never leave a key under a doormat or on a string through the letterbox � it�s the first place any burglar will look. � Make sure tools and ladders are kept in a secure place � burglars will happily use your own garden equipment to break into your home. � If you�ve taken extra security precautions, let would-be burglars know. If you have an alarm, make sure the box can be clearly seen. If you take part in a Neighbourhood Watch scheme, display a sticker in your window and, if you have a dog, put up a warning sign. � Hide financial documents and keys � if someone does break in you don�t want them to also steal from your bank account or take your car. � Make sure you secure all your doors and windows every time you leave the house, even if you are �just popping out�. � If you are in the garden or upstairs, make sure your downstairs doors are locked � in the summer burglars can often just open the front door and help themselves. � Make use of all door and window locks fitted in your home. � Consider getting a letter box deflector. � Keep house keys upstairs or store them near the door out of sight for easy access in an emergency. � Keep your car keys away from the front door and store them somewhere safe. � Keep handbags out of sight. The National Fraud Intelligence Bureau (NFIB) and Action Fraud have noticed a rise in the reporting of victims being recruited via Facebook to sell items for suspects on eBay � often stating that it is a quick way of making money. The items are said to be bankrupt stock, purchased via auctions, and need to be sold on quickly. The majority reported have been Apple Mac Book Pro/Electrical Items. The victim places the items on eBay and once the items are sold, the victim will get paid and transfer the funds to the suspect/recruiter. Once the suspect/recruiter gets the funds, the purchasers are claiming that they have received empty cereal boxes or often no goods at all, leaving the victim being reported as the actual suspect, and leaving them out of pocket as their account will be debited. � Consider conducting research on other information provided by the seller, for example: a mobile phone number or email address could alert you to negative information associated with the number/email address online. � Be very cautious of unsolicited emails or approaches over social media promising opportunities to make easy money. � When accepting offers, verify the company/entity details provided to you and check whether they have been registered in the UK. The Longmoor Neighbourhood Policing Team would like to remind people to keep their property safe and secure. � Double check your vehicle is locked. Try the door handles. � Don't leave anything in your car even low value items. If it's not there, it can't be stolen. � Your car isn't safe to be left unlocked on your driveway. Nearly half of all incidents where items are stolen from cars happen overnight, close to the owner�s home. � Make sure your garage or shed is fitted with a good strong lock, padlock, door hinges or other security device such as a garage defender. � Place all tools and garden equipment in locked sheds and garages. � Consider fitting an alarm to your garage or shed. Most DIY store stock battery operated alarms which are suitable for this purpose. � Secure/padlock more valuable items such as lawn mowers and bikes to an anchor point within the shed or garage. � If your own a quad / motorcycle fitted with an alarm or immobilise, ensure it is activated. � Consider padlocking your quad / motorcycle to a secure point within the garage / shed. � Consider the use of a quad / motorcycle wheel clamp. � Consider external security lighting, CCTV and shed alarms. � Keep the structure in good repair. Ensure surrounding fences and gates are in good repair to prevent unlawful access. � Register all valuables for FREE on www.immobilise.com. Take photos and keep a note of serial numbers on your items. If you have any information regarding any incidents, please contact 101 or contact Crimestoppers on 0800 555 111. The police have issued a document for householders to check the security of their homes. It is well worth a look. The National Farmers' Union has launched a new service for farmers and the public to give information anonymously about rural crime, in partnership with the charity Crimestoppers. For more details: https://www.nfuonline.com/news/latest-news/nfu-and-crimestoppers-launch-new-rural-crime-reporting-line/. Trading Standards would advise consumers not to agree to work that is instigated as a result of a cold call or via a leaflet drop. Consumers should obtain at least 3 written quotes from reputable businesses or traders who belong to a recognised trade association, such as the Hampshire County Council Buy With Confidence Scheme, details of which can be obtained by telephoning 01962 833620, via email or via the website. Members of the Buy With Confidence scheme are fully audited to ensure their trading practices are legal, honest and fair and have been checked for trustworthiness and compliance with consumer protection laws. Traders who agree work at the home of an individual or at a place other than their usual business premises are required by law to provide consumers with a Notice of Right to Cancel, which gives consumers a 7-day cooling off period. Work should not commence until this period has ended, unless written agreement is first obtained from that consumer beforehand. If anyone has any information about traders who are cold calling or requires any advice on doorstep crime they can contact Hampshire County Council's Quick Response Team on 01962 833666 (Monday � Friday 0900hrs to 1700hrs) where specially trained officers are on hand to provide assistance. If urgent assistance is required outside these hours please contact Hampshire Police on the non-urgent number 101, or 0845 045 4545, or dial 999 if you feel threatened or intimidated. Rogue traders are people pretending to be builders or �qualified� trades men or women needing to do 'urgent' repairs or sales people offering bargain products. � They often pressurise householders to make quick decisions to have work done, pay in advance for materials or do poor work at highly inflated prices. � They will often cold call on vulnerable households and deliberately overcharge for unsatisfactory goods and services. This can include charging for unnecessary work, damaging property deliberately in order to obtain money, leaving work unfinished and intimidating householders. � Victims of this practice are often vulnerable or elderly and in the most serious cases, offenders will return to the same victim again and again until their savings are exhausted. � Close and lock your back door before answering the front door. � Use a spy hole, chain or window to have a look at the caller before answering the door. If you do not recognise them speak through the closed and locked door. � Never buy goods and services from people calling unexpectedly or unannounced at your door. � If the caller is selling something or offering work on your house or garden tell them that you are not interested and ask them to leave. � If they do not leave tell them you will call the police. � Always ask for proof of identity. Take it from the person (through the letterbox) and read it carefully. � Phone the company or organisation the caller claims to be from (use the number in the phone book) to confirm their identity. � If you have any doubt � keep them out. Remember it's your home. Don't be afraid to say �No� and report anything suspicious to the police. � Take advice from family, friends or reputable traders to check if the work really needs doing. � Avoid any cold callers that may turn up or ring unexpectedly or unannounced offering to carry out repairs. � Only use reputable workmen recommended by family and friends, or those who have worked satisfactorily for you before. Consider contacting your local Trading Standards who may run a registered traders scheme for advice on choosing a tradesperson. Advice and information is also available on the Citizens Advice website. � If you do decide the work needs doing, always obtain at least 3 quotes and make sure the quote you accept is in writing. � Ask traders to provide you with written contact details and ask about insurance backed guarantees. � Ask for details of previous satisfied customers and contact them. Go and see the work for yourself if you can. � Consumer law allows you a seven day cooling-off period so you can change your mind about any service offered by someone who arrives uninvited or by appointment. � Keep back part of the cost until the repair job has been satisfactorily completed. This will provide an incentive for the trader to complete the job or put right any problems. � Report any unscrupulous traders either to police or Citizens Advice. Look out for your neighbours. Friends, neighbours and people who have regular contact with older and vulnerable people can help them to make their lives more secure. Research shows that fewer distraction burglaries are committed in areas where there is a supportive community. � Keeping an eye on people calling in the area or acting suspiciously. � Noting the registration numbers of vehicles parked in your area for a period of time. � Calling on vulnerable people regularly. If it is not too much trouble, help them keep their front garden tidy and find reliable tradespeople for any maintenance work that really does need to be undertaken. � Inform the police to provide information about suspicious people, activity or vehicles, however insignificant it may seem. � additional information relevant to the crime type and district focus E.G. Domestic Violence/Theft From Motor Vehicle. � anything else you would like to give feedback on regarding the current packs or suggestions for the development of the idea of a care pack or similar idea. The remit is to look at this idea starting completely afresh so Sam and Russ have licence to create whatever is best for anyone who wishes to access or receive this information, addressing current-day customer satisfaction on a cost-effective viable basis. You can contact them at: Hampshire Force Control Room, tel no: 0845 045 4545 and ask for 71- 5125; mobile: 07720 305613; or email. Confused about who to call? Be on your guard and do not supply or confirm any personal, banking or card details to anyone who makes contact with you. Trading Standards would also advise consumers not to agree to work that is instigated as a result of a cold call or via a leaflet drop. Consumers should obtain at least three written quotes from reputable businesses or traders who belong to a recognised trade association, such as the Hampshire County Council Buy With Confidence Scheme. Details of this scheme can be obtained by telephoning 01962 833620, via email or via the website. If you have any concerns regarding cold calling matters, please do not hesitate to contact Hampshire County Council's Quick Response Team on 01962 833666. Cold caller stickers to put on your front door are available at the Parish Office. There is now a link to the new scam bulletin on Hantsweb. This bulletin can be distributed to the public and the contact details for reporting scams through the Citizens Advice Consumer Helpline are included. However, partners are invited to refer concerns directly to Hampshire County Council Trading Standards by telephoning 01962 833 620 or emailing ts.intel@hants.gcsx.gov.uk. Hampshire County Council Trading Standards say there are an increasing number of fraudsters running scams that target businesses specifically. They have supplied the content for an article that details a list that small businesses and self-employed people can sign up to if they would like to receive alerts when new scams are identified. Hampshire Trading Standards Service operates an approved trader scheme called Buy With Confidence which includes security companies. Information is available at www.buywithconfidence.gov.uk or by telephoning Consumer Direct on 01622 626503. Surgery Signposting volunteers link local people with support services offered by local community groups. The aim is to connect you to the information and support you need to live an active, happy and healthy lifestyle. See poster for further details. The village now has a defibrillator which is located at Londis store. Jackie Taylor-Green has been trained in its use. The device is designed to be used by the public without training as it guides a user step-by-step. This has been made possible through a grant from our County Councillor, Adam Carew. An application has been made to our District Councillor, Yvonne Parker Smith, for funding for an exterior case so that the machine is available at any time. Get Active East Hampshire is here to help you achieve a more active and healthier lifestyle. See the website www.getactivenow.org.uk. More than a thousand people across Hampshire and the Isle of Wight have vowed to make sport happen in their communities. Being a Sport Maker is a chance to have fun, meet people and make new friends, gain further qualifications and enjoy unique experiences. For more details about the Sport Makers programme visit www.sportmakers.co.uk or www.sporthampshireiow.co.uk/volunteering. For more information, or if you have any questions regarding Sport Makers, please contact Tom Dickson or call 01962 845189. Hampshire County Council has launched a project called Common Assessment Framework for Adults (CAFA). Its aim is to find new and innovative ways to share health and social care information. The project is funded by the Department of Health. See the release for Parish magazines for further information. Headley Voluntary Care offers help to people needing to get to the doctor, dentist, optician and so on. See their poster for details of how to contact them. There is a website that has been designed to encourage residents to record their own personal information and share this easily with health, social care and emergency services when needed. See the original press release for more information.